Every time veteran guitar-player and former Dire Straits frontman Mark Knopfler releases an album, there are those who keep hoping stubbornly and naively, for a Dire-Straits reunion record or at least for a sound resembling that of Brothers in Arms. I think of those people in the same way I think of those who believe that Elvis is still alive or that “disco” will someday make a comeback. Alas, they are bound to be disappointed. Meanwhile, Mark Knopfler continues making the music he cares most about which is the music he’s been making for the last eighteen years. His latest album, the 20-track double-record Privateering just goes to prove that there is plenty of fuel left in the tank. The sound remains the same Mark Knopfler fans have gotten accustomed to ever since the start of his fruitful solo career and, as a follow-up to the critically acclaimed Get Lucky (released in 2009) Privateering does not disappoint. The direction is mostly the same and fans are going to find his instantly-recognizable sound in songs like “Redbud Tree”, “Miss You Blues”, “Seattle”, “Radio City Serenade” or “Bluebird”. Violins, harps, whistles and flutes provide the familiar celtic folk-rock aura present on almost every solo-record of Mark's since his 1996 debut Golden Heart. What’s different, this time around, is that many of the songs that aren’t in his, let’s call it "traditional style" , are very blues-oriented a direction he started heading towards with “You Can’t Beat The House” off his prior album Get Lucky (2009). A great number of songs (i.E “Don’t forget your hat”, “Hot or What”, “Got to have Something”, “I used to Could” and others) have the feel of blues, which is something of a more recent aspect of his music. Alongside his usual instruments he heavily employs the bluesman’s second-best friend, the harmonica. While these songs are fairly pleasant interludes from his “standard” tracks, some of which are very melancholy and at times downright sad, I am still not a big fan of his blues-efforts as I feel there are others who do this better. On this record Mark seems more preoccupied with the curret socio-political and economic climate and perhaps more inclined to join the wave of pessimism as most of his songs seem to have an air of melancholy and, at times, profound sadness. The beautiful and heartbreaking “Haul Away” and the haunting and breathtaking “The Dream of the drowned Submariner” both speak of loss at sea and while “Go, Love”(for me one of the highlights of the record) and “Miss You Blues” lament over lost love. Even in the tracks with a more uplifting bet (see “Corned Beef City” or “Got to have Something”) the atmosphere is bleak as though saddled with a quiet acceptance of a situation that is at best difficult and at worst hopeless. 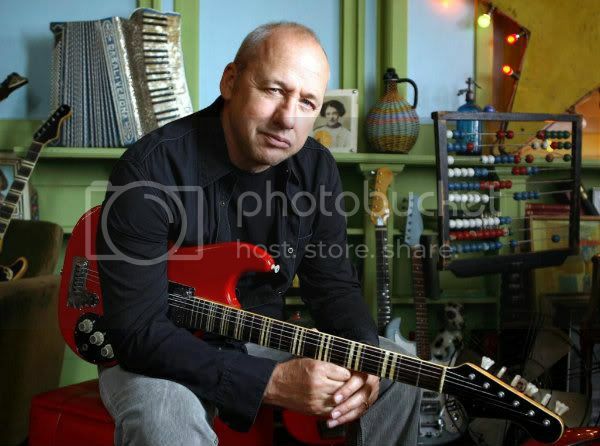 There are though small glimpses of Dire Straits ballads in songs like “Go, Love”, “Seattle” and “Blood and Water” and in fact, the interesting trait about the album is that on it Mark seems to have sampled parts from the sound of his entire musical career, from the celtic folk-rock of Golden Heart, to the catchy Americana-influenced pop-rock of Shangri-La and the country-blues feel of parts of All The Roadrunning. In typical Mark Knopfler fashion the foundation the record is built on is a wise use of instruments. Though one of the most celebrated guitarists of all time Mark never lets his instrument dominate a song if it’s not in the best interest of the story he is trying to tell. He always uses the guitar simply as a tool meant to further the overall impact of the song and not to draw attention to itself (as much as I love Gary Moore – may he rest in peace – sometimes the ten minute guitar-solos that followed the actual songs could get tiring). Thus Mark’s usual gang of Guy Fletcher, Glenn Worf and Richard Bennett alongside a vast array of talented musician contribute their talent to make this a very complex and well-balanced album. Privateering again goes to prove that while Mark’s biggest hits came in his Dire Straits-past his best music and most interesting stories belong to the present.